What better way to break into my mini 6-inch cast iron skillet than to bake a brownie in it? I also have cornbread and skillet chocolate chip cookies in mind but I started with a brownie because frankly, I'll take/make any excuse to eat brownies. This 6-inch skillet was one of my Christmas stocking stuffers; it's taken me more than six months to put it to use! Sometimes that's just how it goes but now that I've broken it in, I'll hopefully keep putting it to use. So this is a very simple story...the familiar plot line of brownies and ice cream, which is just a match made in heaven. I made this as an easy dessert after we did a little grilling and chilling outside for dinner over the past weekend. And since we tend to stretch out our birthday celebrations (it has to span at least the weekend prior and up to the actual day), it also served as another birthday treat. So I put a candle on it and we sang "happy birthday" again. I do feel a little bad that the little guy's birthday seems to eclipse Father's Day every year since they are so close together. Naturally, my husband doesn't mind one bit. This is a dense, very chocolaty, cocoa-based brownie via Dessert for Two. It is very much like Alice Medrich's recipe, aka our "house" brownies. I had planned to halve that recipe for this small skillet but the recipe did the job for me. Since we've had plenty of sprinkles lately and we were sharing this after a hearty meal, I topped the brownie with some neapolitan ice cream and just a little shower of sprinkles (I did have extra ice cream on the side for serving though). Please feel free to deck your sundae out with the works - bring on the whipped cream, hot fudge, chopped nuts, and cherry on top! This is just the kind of fun dessert to make a mess out of. It's fun for a quick dessert, to help celebrate a birthday, or even as a Father's Day treat. Eating brownies with ice cream is always a good time! It'd be fun to dig right in with spoons and go wild but I scooped portions of this brownie up into bowls and served it with additional ice cream. This brownie is dense and rich; as small as it looks, it really is enough for 3, or even 4 people, to share. Since we were grilling and doing a few things at once, I made the brownie before we sat down for dinner and I let the brownie sit in the kitchen until we were ready for dessert. The 10th birthday festivities for our little guy has finally wrapped up! Now, I'm looking toward Father's Day. I'm planning to make one of my husband's favorite things for breakfast, a Dutch baby pancake. We have plans to go out for lunch and I'm going with a classic of steak and potatoes for dinner. Interestingly enough, of all things, my husband mentioned how much he'd enjoy the matcha almond sponge cake for dessert when I asked him what he'd like! I was planning on something else but now that he's said it, I just might attempt the matcha cake again. Whatever your plans are, I hope you have a wonderful weekend! Preheat oven to 325 degrees. Prep a 6-inch cast iron skillet by lightly spraying with cooking spray. Place butter into a medium-size microwave-safe bowl. Add sugar, cocoa powder, espresso powder (if using) on top. Microwave on high for 30 seconds. Remove the bowl from the microwave, stir, and heat again on high for another 30 seconds. Carefully remove the bowl from the microwave and stir in the salt and vanilla extract. Continue stirring for another minute to release some of the heat. Add egg and stir well to combine. Sprinkle flour on top of the chocolate mixture and stir vigorously for 50 strokes with a wooden spoon. The brownie batter should look shiny and thick, pulling away slightly from the bowl. Stir in the chocolate chips, if using (make sure the batter is not too warm or the chocolate chips will melt). Scrape the batter into the skillet. Bake for roughly 20-25 minutes, or until a cake tester inserted in the center comes out with a little bit of moist batter attached (err on the side of taking it out a bit early to ensure a moist center, remembering the brownie will continue to set some more with residual heat in the pan). 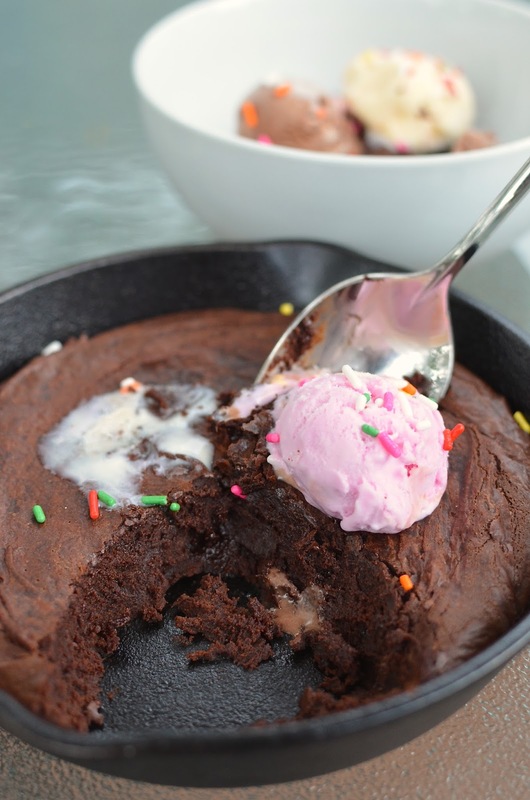 Top brownie with ice cream and other toppings and serve immediately, if possible. Now I have to get myself a skillet too. The brownie looks heavenly and I love just how moist it looks. Aaw yay! Love how you guys stretch out birthday celerations! And 10 years old is definitely a big reason to extend the celebrations even longer. Happy Happy birthday to your sweet man again. This brownie sundae looks like the perfect treat! I love the three scoops of ice cream and of course the pretty sprinkles! So decadent and delicious! Cast iron skillets are great - they even have teeny 4-inch ones that'd be ideal single serves. Yes - brownie sundaes are always so so good!! haha - glad you think so, too, Lorraine. I love mini things, too. Now I'm drooling! What a great dessert - especially for 2 1/2! I love the way you celebrate birthdays - I know your son much appreciate how special you make it for him. Ice cream is a must! Have a great weekend and a wonderful fathers day. Hope you have a great weekend. Father's Day is supposed to be wet here but we'll make the most of it! This is so gorgeous and fun!! Yes - I love a fun dessert. What a lovely thing to use to bake a brownie in, love the ice cream on top! Love the way you celebrate birthdays Monica, everyone must feel very special at your house. These brownie looks like the perfect way to end a party. omg. this MUST be yummy! Love the way you celebrate birthdays!I would love to try your brownie! The warm, with the cold, with the sprinkles, with the..... I can't - I must have it! Oh, you are really are a sweetheart. What a nice way to celebrate. 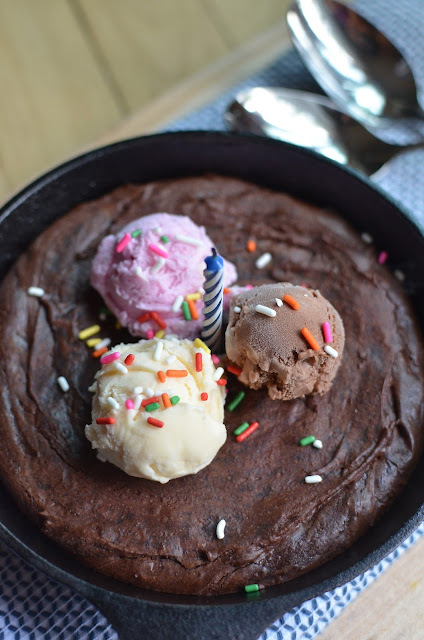 Love the idea of a skillet brownie and a icecream on top....it's perfect. You know, I kid you not, I've been thinking of a skillet cake or brownie for a while. I'm gonna print this out. Looks pretty darn easy too. Enjoy the week my dear. Happy Father's day to your hubby! WOW. i totally just got a new iron skillet as a gift & i didnt know what to do with it! lol but now i know;) thank you for the recipe! I so want a big scoop of this goodness..... Even though it is still the morning, I don't mind having this for breakfast at all! That mini skillet is cute! I want one too!! I think I just need a cast iron skillet in general. Just wish they are not that heavy!!! I obviously need at least 1 6-inch skillet in my house THIS. INSTANT.